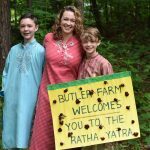 Everyone waited at the entrance to Butler Farm, tingling with excitement and anticipation, waiting for the luxurious, decked out limousine to approach, carrying Jagannathar, Baladev, and Subhadra Devi. 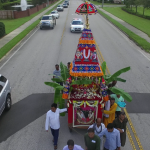 Months of preparation, dedication, and sleepless nights had gone in to the creation of the Ratha Yatra, and everyone was anxious for it to finally come together with Their grace. 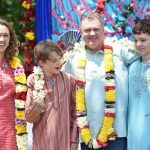 Each person had experienced their own trials with the Lord, from figuring out scheduling and set up to fit the Farm schedule to organizing all 56 offerings for the Chappan Bhog. 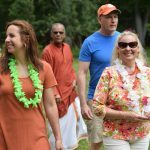 Although Krishna’s Vrindavanam was always perfect, every Satsang member, including the entire Butler family, the owner of the farm, had to work tirelessly to transform the farm into a veritable Vrindavan! 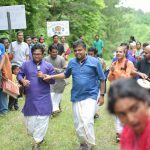 At last on Saturday May 26th 2018, the decked out limousine pulled up to the gate of the farm, where all the bhaktas were enthusiastically chanting nama to welcome the Lords of the Universe. 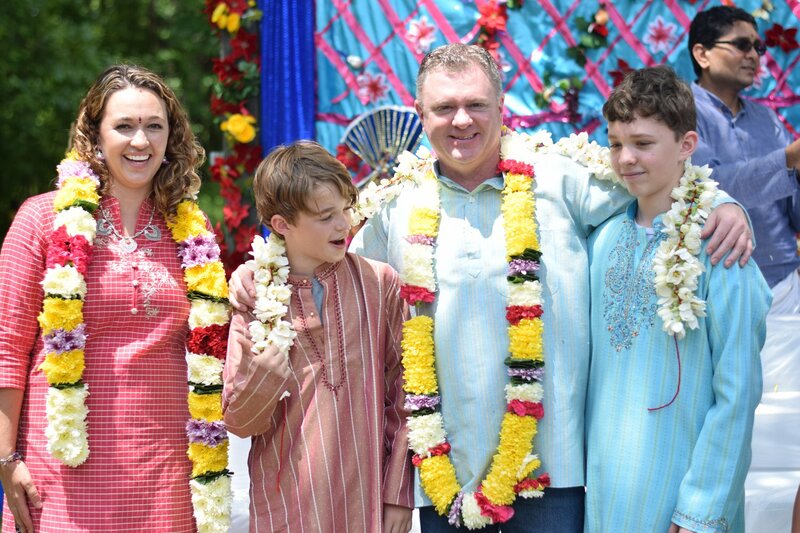 Devotees lovingly offered flowers as the limousine carried Them to the main area. 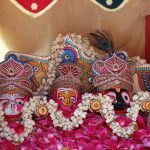 A luxurious red carpet was rolled out for Jagannathar, Baladev, and Subhadra Devi to board the Ratham, on which Guruji had already taken a seat. 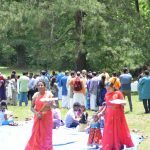 The Lord was indeed playing with His devotees, as full grown men struggled to carry Him! 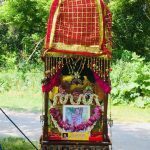 The Ratha Yatra finally began after commencement rituals were performed by Sriman Swamin of Hanuman Mandir. 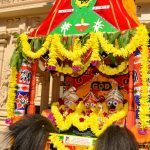 The Ratham, unlike other chariots, was completely organized, pulled, and steered by energetic bhaktas, with dynamic bhajans and dancing going in between the two ropes. 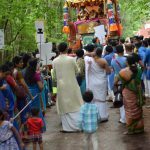 After some improvisation and jugaad, the procession continued to the bottom ground despite the towering Ratham briefly getting tangled in the tree bowers above. 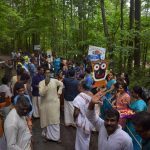 There, various refreshments and drinks quenched the thirst of the 300 bhaktas, who enthusiastically danced and chanted during the Yatra. 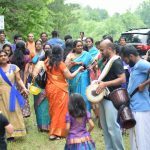 Numerous impromptu dances were held with vigor, as bhajans and nama continued. 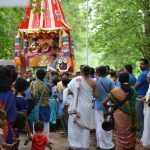 Jagannathar, Baladevar, and Subhadra were carried back up the hill and prepared for the Chappan Bhog. More than 56 different offerings, all in shining copper pots, were set out and offered in front of Them. 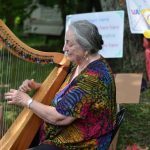 Mahamantra was chanted with the accompaniment of a harp played by a local harpist. 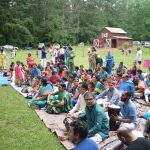 Later on, Sri Ramanujam Ji expressed his happiness and blessings for the entire satsang and the Butler family and relayed Sri Sri Guruji’s blessings for all of us. 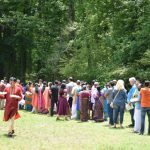 Almost immediately, all the offering were transferred overitnto the main prasadam serving area by the agile coordinators, and serving began instantly. 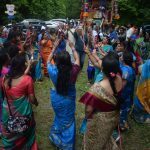 Sumptuous prasadam was thoroughly enjoyed by all, and additional music and dance performances were also held for the pleasure of Lord Jagannath. Various games and activities were set up by the Youth group for the children to enjoy. 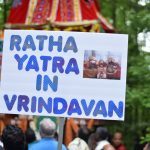 The lasting legacy of this Ratha Yatra will be in the form of the two bricks engraved with Mahamantra and Guruji’s quote about leaving all else and focusing our lives only on God. 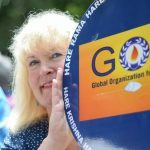 These bricks will be placed in Mrs.Liz Butler and her family’s Montessori school, literally cementing the impact of this event. 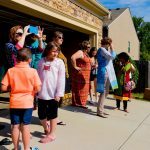 Everyone left the Ratha Yatra with a heart full of Jagannatha darshanam, mind resonating with divine Mahamantra vibrations, and stomach full of sumptuous prasadam. 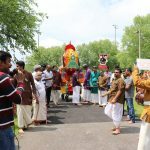 Thanks to Sabariji and Savithaji for taking the lead and organizing the Ratha Yatra event, and to Liz ji and her family for their continuous support and for flying in her extended family to attend the Ratha Yatra and welcoming several of her neighbors and friends to enjoy and serve the Lord of the Universe.